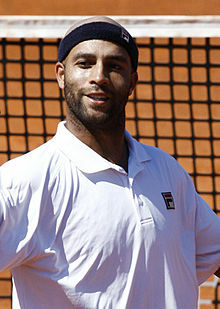 James Riley Blake  (born December 28, 1979) is an American retired professional tennis player. Blake was known for his speed and powerful, flat forehand. During his career, Blake amassed 24 singles finals appearances (10–14 record), while his career-high singles ranking was World No. 4. Career highlights included reaching the final of the 2006 Tennis Masters Cup, the semifinals of the Beijing Olympics, the quarterfinals of the Australian Open (2008) and US Open (2005, 2006), as well as two titles at the Hopman Cup (2003, 2004) and being the No. 1 ranked American singles player. Blake was a key performer for the United States 2007 Davis Cup championship team, going 2–0 in the championship tie vs. Russia at second singles. The 2006 Tennis Masters Cup was a men's tennis tournament played on indoor hard courts. It was the 37th edition of the year-end singles championships, the 32nd edition of the year-end doubles championships, and was part of the 2006 ATP Tour. It took place at the Qizhong Forest Sports City Arena in Shanghai, People's Republic of China, from November 12 through November 19, 2006. Blake was born in Yonkers, New York, to an African American father, Thomas Reynolds Blake, and a British mother, Betty. He has a brother Thomas, who has also been a professional tennis player, and three older half-brothers: Jason, Christopher, and Howard, and a half-sister Michelle. Yonkers is a city in Westchester County, New York. It is the fourth most populous city in the U.S. state of New York, behind New York City, Buffalo, and Rochester. The population of Yonkers was 195,976 as enumerated in the 2010 United States Census and is estimated to have increased by 2.5% to 200,807 in 2016. It is an inner suburb of New York City, directly to the north of the Bronx and approximately two miles (3 km) north of the northernmost point in Manhattan. Thomas Blake, Jr. is an American professional tennis player. Blake was born in Yonkers, New York to Thomas Sr. and Betty. He has a younger brother, James Blake, who is also a professional tennis player, as well as three half-brothers, Jason, Howard and Christopher, and a half-sister, Michelle. Fairfield Warde High School is a co-educational secondary school located in Fairfield, Connecticut, United States. Blake accepted a wildcard into the US Open where he had a memorable run. After defeating No. 2 Rafael Nadal in the round of 32, Blake beat Tommy Robredo in four sets to reach the quarterfinals where he faced Andre Agassi. The late-evening match is considered one of the greatest classics in the tournament's history. Blake was up two sets and a break in the third when Agassi made a comeback to eventually win in a fifth-set tiebreak. After the match Agassi said, "I wasn't the winner, tennis was". Later in October at the Stockholm Open, Blake won his third ATP tour title, defeating Srichaphan in the final. Blake finished 2005 ranked 22 in the world. Blake lost in the third round of Paris to Richard Gasquet and thus finished outside the top eight players, losing his chance to defend the points he gained as finalist in the 2006 Tennis Masters Cup. In the 2007 Davis Cup finals Blake won his match against Mikhail Youzhny after Andy Roddick had beaten Dmitry Tursunov in the first rubber. The next day Bob and Mike Bryan won the doubles rubber over Igor Andreev and Nikolay Davydenko, sealing the Davis Cup win for the United States. Blake also defeated Tursunov in the last match of the finals to give Team USA 4–1 win. In August 2008, Blake represented the United States as one of its three men's singles tennis players in the Beijing Olympics. In the quarterfinals, he gained one of the biggest wins of his career with his first ever win over Roger Federer 6–4, 7–6. At the time, Federer was ranked as the world's No. 1 men's player. His semifinal match was against Fernando González, the Men's Singles bronze medalist at the 2004 Olympics in Athens. Blake had a triple match point in the final set, but would go on to lose 11–9. He then lost the bronze medal match to Serbian Novak Djokovic. Blake defeated Frank Dancevic in the first round of the Australian Open. His success continued in the second round after deposing of Frenchman Sébastien de Chaunac in a match laden with spectator noise and bad line calls. Blake went on to face the 18th seed, Igor Andreev, in the third round and beat him. He lost in the fourth round in straight sets to the 2008 runner-up Jo-Wilfried Tsonga. Blake returned to action at Wimbledon, where he lost to Dutchman Robin Haase. The result was surprising considering that Haase lost badly to Blake earlier in the season at Delray Beach. During this match, Blake harshly accused ESPN commentator and former WTA player Pam Shriver of disrupting play due to her overly loud commentary from the box situated above the court behind him. This led to a verbal exchange between the two during the match. After the match, an emotional Blake declared that if his knee problems did not subside he might consider retirement. Blake, who refused to take any anti-inflammatories for his knee, called his performance "embarrassing" and said "I can't beat these guys at 80 percent." Despite these comments, Blake chose to continue rehabilitation to prepare for the US hardcourt season. At the Los Angeles Open, Blake's singles fate took a turn for the better. Prior to the tournament, Blake told the LA Times that retirement was "no longer a thought" and that he was "not done yet". In New Haven, his hometown tournament where he had claimed titles in 2005 and 2007, Blake made an impressive display and ousted World No.76 Pere Riba in the first round, converting five of eleven break point opportunities. Blake won the lightning quick match in 35 minutes, making it the shortest match win of 2010. At the 2010 US Open, Blake advanced to the third round losing to eventual finalist Novak Djokovic. Blake finished the year ranked outside the Top 100 for the first time since 2000. Before the beginning of the 2011 tennis tour Blake ended his partnership with coach Kelly Jones, choosing to travel alone. In a preseason interview, Blake stated he was healthy and carrying a positive attitude and would skip the Australian Open. 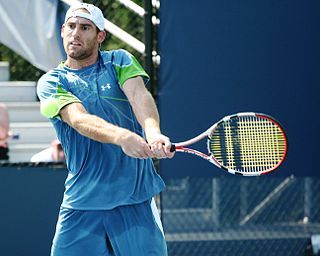 In his first match of the year, on February 8 at the SAP Open in San Jose, Blake defeated American qualifier Jesse Levine  after Levine succumbed to an injury late in the second set. The American ran into red-hot Canadian youngster Milos Raonic in the second round and fell after battling back from a late break down in the second set to force a tiebreaker. Raonic would go on to win the tournament, his first as a pro. Blake was primarily an offensive baseliner. Blake was known for possessing one of the most powerful forehands in the game, with a solid transition game, and an effective serve and volley. Blake also possessed extremely quick footwork, although many claimed that he needed to work on changing direction. Blake's reputation as a "shotmaker," combined with potentially high-error flat groundstrokes made his style of play notably flashy, characterized by both a high number of winners and unforced errors. In turn, this made Blake's game somewhat streaky, as evidenced by his playing history. Lleyton Glynn Hewitt is an Australian professional tennis player and former world No. 1. He is the last Australian to win a men's singles Grand Slam title. Andrew Stephen Roddick is an American former world No. 1 professional tennis player. Fernando Francisco González Muñoz is a retired professional tennis player from Chile. During his career he made it to the quarterfinal round of all four Grand Slam tournaments. He played his only major final at the 2007 Australian Open, losing to top-seeded Roger Federer. He is the fourth male tennis player in history to have won each Olympic medal. The gold medal González won together with Nicolás Massú in the 2004 Olympic doubles competition was the first ever gold medal won by Chile at the Olympics. Robert Louis Ginepri is a retired American professional tennis player. He won three ATP singles titles in his career and achieved a career-high ranking of World No. 15 in December 2005. Ginepri's best Grand Slam result was the semifinals of the 2005 US Open, where he lost to Andre Agassi. Thomas Mario Haas is a German former professional tennis player. He competed on the ATP Tour from 1996 to 2017. After breaking into the world top 100 in 1997, and reaching a career-high singles ranking of world No. 2 in May 2002, Haas's career was interrupted by injuries: he twice dropped out of the world rankings due to being unable to play for twelve months. His first period of injury saw him miss the whole of the 2003 season, and he did not return to the world's top 10 until 2007. He also missed over a year's tennis between February 2010 and June 2011, but afterwards returned to play on the tour. He returned to world No. 11 in 2013 after reaching the quarterfinals at the French Open for the first time in his career. Ivan Ljubičić is a retired Croatian professional tennis player. He reached a career-high Association of Tennis Professionals (ATP) world No. 3 singles ranking on 1 May 2006. His career highlights include reaching a Grand Slam semifinal at the 2006 French Open, and a ATP World Tour Masters 1000 title at the Indian Wells Masters in 2010 as well as 3 other finals, 2 of them coming in 2005 at Madrid and Paris, and the other at the Miami Masters in 2006. Nikolay Vladimirovich Davydenko is a Russian former professional tennis player. He achieved a career-high singles ranking of World No. 3 in November 2006. Davydenko's best result in a Grand Slam tournament was reaching the semi-finals, which he accomplished on four occasions: twice each at the French Open and the U.S. Open, losing to Roger Federer in all but one of them. His biggest achievement was winning the 2009 ATP World Tour Finals, and he also won three ATP Masters Series. In mid-October 2014 Davydenko retired from competitions. Jarkko Kalervo Nieminen is a Finnish former professional tennis player. His highest ranking of world No. 13, achieved in July 2006, is a Finnish record. He has won two ATP singles titles and five doubles titles in his career. His best performances in Grand Slam tournaments have been reaching the quarterfinals of the 2005 US Open, the 2006 Wimbledon Championships, and the 2008 Australian Open. Gilles Müller is a Luxembourgish retired professional tennis player. He is a two-time Grand Slam quarterfinalist and the most successful male tennis player in the history of his country. Müller won two titles on the ATP World Tour and achieved a career-high ATP singles ranking of world No. 21 on 31 July 2017. He was known for his powerful left-handed serve and excellent net skills. Following his retirement, Müller was appointed as Luxembourg's Davis Cup team captain. Gaël Sébastien Monfils is a French professional tennis player. He reached a career-high ATP world No. 6 singles ranking on November 7, 2016. His career highlights include reaching two Grand Slam singles semifinals at the 2008 French Open and 2016 US Open, and three ATP World Tour Masters 1000 singles finals at the Paris Masters in 2009 and 2010 and in the 2016 Monte-Carlo Masters. Jürgen Melzer is an Austrian professional tennis player. He reached a career-high singles ranking of world No. 8 in April 2011, and a doubles ranking of world No. 6 in September 2010. He is a left-handed tennis player, but is right-handed in everyday life. He has a younger brother, Gerald Melzer, with whom he has played doubles in several tournaments. Gilles Simon is a French professional tennis player. He has a career-high ATP singles ranking of world No. 6 attained on 5 January 2009. He turned professional in 2002 and has won 14 singles titles on the ATP World Tour. Marin Čilić is a Croatian professional tennis player. Over the course of his career, Čilić has won 18 ATP singles titles, including a Grand Slam title at the 2014 US Open. His career-high singles ranking is world No. 3, achieved on 28 January 2018. Čilić first came to international prominence by defeating world No. 2 Andy Murray in the fourth round of the 2009 US Open, and then reaching the semi-finals at the Australian Open a few months later. He was also runner-up at the 2017 Wimbledon Championships and the 2018 Australian Open, losing to Roger Federer both times. Čilić has reached at least quarterfinal in all four major tournaments. He is known for his fast serves and powerful ground-strokes. Kevin Anderson is a South African professional tennis player who is ranked world No. 5 in men's singles by the Association of Tennis Professionals (ATP) as of 11 February 2019. In tennis, the seventh edition of the US Open Series, includes ten hard court tournaments that started on July 19, 2010 in Atlanta and ended in New Haven, Connecticut on August 29, 2010. This edition has scheduled five separate men's tournaments, four women's tournaments, and the Pilot Pen Tennis Tournament that will host both a men's and women's event. The series included two ATP World Tour Masters 1000 and two WTA Premier 5 events to headline the series. Jack Sock is an American professional tennis player who is currently ranked No. 2 in the world in doubles, and regularly partnered with Canadian tennis player Vasek Pospisil until July 2016. Together they won the 2014 Wimbledon championship, a victory that helped vault them into the Top 10 of the ATP doubles rankings. Additionally, he won the 2011 US Open mixed doubles title with fellow U.S. player Melanie Oudin as well as the 2018 Wimbledon and 2018 US Open men's doubles titles with Mike Bryan. Following his US Open win, Sock reached a career-high doubles ranking of No. 2 in the world, behind Mike Bryan. He has won four career ATP singles titles and fourteen doubles titles. The 2015 ATP World Tour Finals (also known as the 2015 Barclays ATP World Tour Finals for sponsorship reasons) was a men's tennis tournament that was played at the O2 Arena in London, United Kingdom, between 15 and 22 November 2015. It was the season-ending event for the best singles players and doubles teams on the 2015 ATP World Tour. ↑ "James Blake stats at Tennis Warehouse". Tennis-Warehouse.com. Retrieved November 19, 2006. ↑ Dodds, Eric (August 29, 2013). "A Fitting Farewell for James Blake in Flushing". Time. Retrieved September 8, 2014. ↑ "Blake's parents prevented race from jading him". USA Today. September 8, 2005. Retrieved August 30, 2015. 1 2 Karazin Owens, Deb; Zeitchick, Norman (May 1, 2006). "James Blake: Fairfield's Hometown Hero". Wilton Online. Retrieved September 8, 2014. ↑ "Crimson Tennis Star Blake Becomes Pro - News - The Harvard Crimson". www.thecrimson.com. ↑ "Blake Talks Harvard Before Aussie Open - Sports - The Harvard Crimson". www.thecrimson.com. ↑ "Agassi outlasts Blake in five sets". ESPN . Retrieved 8 September 2005. ↑ "Round Robin 1". Archived from the original on March 21, 2007. ↑ "Round Robin". Archived from the original on March 28, 2007. ↑ Association of Tennis Professionals (November 30, 2007). "Roddick, Blake Place USA in Reach of Davis Cup Title". Association of Tennis Professionals. Archived from the original on December 6, 2007. Retrieved December 1, 2007. ↑ International Tennis Federation (December 2, 2007). "Davis Cup – World Group 2007 Final Results". International Tennis Federation. Retrieved December 5, 2007. ↑ "Blake eliminates Federer from Olympic Tennis". Archived from the original on August 15, 2008. ↑ "Blake into third round after noisy encounter". Reuters. January 22, 2009. ↑ "Tennis – ATP World Tour – Blake Sidelined With Knee Injury". ATP World Tour. Retrieved February 18, 2013. ↑ "James Blake Contemplating Retirement". Pro Tennis Fan. June 23, 2010. Retrieved February 18, 2013. ↑ Pucin, Diane (July 25, 2010). "Tennis pro James Blake is itching to pull rank — upward". The Los Angeles Times. 1 2 "Winter 2011 Interview". Jamesblaketennis.com. Archived from the original on April 25, 2012. Retrieved February 18, 2013. ↑ "James Blake comeback begins with solid win". USA Today. February 8, 2011. Retrieved February 8, 2011. ↑ LTD, Digital Sports Group. "James Blake Tennis Player Profile". www.tennis.co.uk. ↑ "The Ups and Downs of James Blake · Tennis-Prose.com". www.tennis-prose.com. ↑ "Newspage". Tennis-warehouse.com. Archived from the original on June 26, 2007. ↑ "James Blake To Wear Fila Footwear, Apparel, Appear In Marketing". SportsBusiness Daily. January 16, 2009. Retrieved September 8, 2014. ↑ "BLAKE'S NEW CLOTHING LINE INSPIRED BY FATHER". ATP World Tour. August 26, 2009. Retrieved September 8, 2014. ↑ "Evian(R) Natural Spring Water Becomes Official Sponsor of Olympus US Open Series Tennis Tournaments". Newswire. April 8, 2008. Retrieved September 10, 2014. ↑ "TENNIS: USTA and Evian Natural Spring Water Extend Twenty-Two Year Partnership". USTA Tennis. March 31, 2008. Retrieved September 10, 2014. ↑ Larkin, Mike (November 12, 2012). "Sounds like a lovely service". The Daily Mail. London. Retrieved November 13, 2012. ↑ Daly, Michael (June 21, 2012). "Blake, now a father" . Retrieved November 13, 2012. ↑ "Celebrity Poker Showdown Tournament 2". BravoTV(www.bravotv.com). Archived from the original on October 14, 2007. Retrieved September 3, 2007. ↑ CoryATX (October 17, 2010). "Full Tilt Poker Adds Tennis Pro James Blake". FlopTurnRiver.com. Retrieved August 26, 2013. ↑ "James Blake Player Profile". High Stakes Database. Retrieved August 26, 2013. ↑ "James Blake Profile". US Olympic Committee (www.usoc.org). Archived from the original on September 30, 2007. Retrieved August 21, 2007. ↑ Patrick, Dan (2003). "Outtakes with James Blake". ESPN . Retrieved May 2, 2006. ↑ Pratt, Jane (2005). "Tennis Great James Blake, Anthem Blue Cross and Blue Shield and the Virginia Historical Society Announce an Acquisition of Arthur Ashe's Personal Items". Anthem.com. Retrieved May 2, 2006. ↑ "Four Found Dead at Florida Home of Tennis Star James Blake". People. May 7, 2014. ↑ Mahan, Mike; McShane, Larry (May 8, 2014). "Father of family found dead in James Blake's home bought fireworks, gas cans in days before tragedy". Daily News . Retrieved January 12, 2015. 1 2 Mueller, Benjamin; Baker, Al; Robbins, Liz (10 September 2015). "Bratton Apologizes for Arrest of James Blake, Ex-Tennis Pro". The New York Times . Retrieved 10 September 2015. ↑ News, A. B. C. (June 27, 2017). "Tennis star reveals why he dropped legal action in wrongful detention case". ABC News. ↑ Nathan, Giri. "James Blake Settles NYC Police Brutality Case On Condition That City Creates Fellowship To Take On Cop Misconduct". ↑ "Like Others Before Him, James Blake Is Taking A Stand". ↑ "James Blake details inspiration behind 'Ways of Grace'". ↑ "Former Tennis Player James Blake On Athletes And Activism". NPR.org. ↑ Swenson, Kyle (October 3, 2017). "NYPD officer: Former tennis star James Blake defamed me as 'a racist and a goon'". The Washington Post. ↑ "Mission". The James Blake Foundation. Archived from the original on September 11, 2014. Retrieved September 8, 2014. ↑ Marshall, Ash (November 10, 2011). "B/R Interview: James Blake Talks About His Charity Work and the Tennis Community". Bleacher Report. Retrieved September 8, 2014. ↑ Bruehl, Erin (January 1, 2010). "Blake's "Serving for a Cure" a Smash Hit in New York". Long Island Tennis Magazine. Retrieved September 9, 2014. 1 2 "American Tennis Star James Blake to Launch Cancer Research Fund in His Father's Name at Memorial Sloan Kettering Cancer Center". Memorial Sloan Kettering Cancer Center. July 10, 2008. Retrieved September 8, 2014. Wikimedia Commons has media related to James Blake .